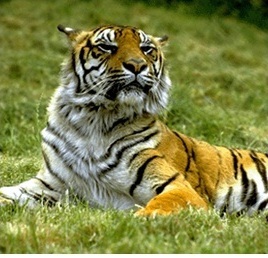 The Mundanthurai-Kalakad wildlife sanctuary in Tirunelveli district is developed as a National Tiger Reserve from the year 1988 with a total area of 817 sq. km in the south most western ghat ranges. The nearest stations are Cheranmahadevi, and Ambasamudaram which are 20kms and 15 kms respectively from Tirunelveli. The nearest airports are Madurai and Trivandrum. One can reach this place by road also from Ambasamudaram and Kalakad. Frequent buses are plying from Ambasamudaram and Kalakad to this place. Out of 817 sq. kms.459 sq.kms is in core zone and 358 sq.kms. is in buffer zone.There are 24 identified nature trails which is spread over the reserve. It gives a thrilling experience to trekkers. This Tiger Reserve is open on all days between 6 a.m. to 6 p.m. throughout the year. However the best season is September to January. Forest Rest Houses and dormitories are available at Mundanthurai and Thalayanai. Koonthankulam Bird Sanctuary or Koonthankulam is a 1.2933 sq.km (0.4993 sq mi) protected area declared as a sanctuary in 1994. It adjoins the tiny village of Koonthankulam in Nanguneri Taluk of Tirunelveli district, Tamil Nadu, India. It is just 38 km away from Tirunelveli (a bustling town on the banks of the Tamirabaraparani River). 8.58102°N 77.76123°E It is composed of Koonthankulam and Kadankulam irrigation tanks, conveniently linked by tar road.This is the largest reserve for breeding water birds in South India. International name: Koonthangulam Bird Sanctuary.A tiny village in the far south,Koonthankulam in Nanguneri Taluk of Tirunelveli District is emerging as a new favourite of the migratory birds. It is just 38Kms away from Tirunelveli and is in the nearby Nanguneri Taluk. 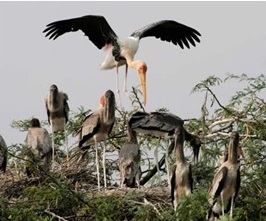 It may soon be catapulted into the list of popular water bird sanctuaries in the country. This village is sparsely populated. Migratory birds start coming by December end and fly away to their northern homes by June or July after they lay eggs,hatch them and the young ones grow old enough to fly with the older ones. About 35 species of birds visit this calm but congenial village for breeding.The birds called Painted strokes are coming from North India and East European Countries to this place. The birds coming to their backyards for five generations are protected vehemently by villagers and regarded as harbingers of luck. The excreta of birds ‘guano’ is collected by villagers in summer along with silt to use as fertilizer in their fields. From children to grannies in the village all protect them, their nests and fledgelings. Chicks fallen are taken care of in the rescue centre till they are able to fly on their own.Anybody troubling the nests are punished inn their own methods of shaving the head,or making the procession on donkey. Manjolai is 57 km away from Tirunelveli and is at an elevation of 1162 sq. metre. There are many tea plantations in and around this place. Bombay Burma Tea estate is famous one in this area. About 4000 people are working in these tea plantations.Manjolai is noteworthy for the climate,scenery and calm atmosphere.This place can easily be compared with Udhagamandalam, the queen of Hill stations as far as the pleasing climate and peaceful natural atmosphere are concerned.On the way to Manjolai from Manimuthar there is a very beautiful place called Dasan Pool with plenty of fresh water, greens and fine climate.Just above manjolai,there are places like kakkachi and nalumukka which are real gifts of the nature.Other important tourist spots near Manjolai are the kakkachi and Nalumukku.